Big Sudoku Puzzle Magazine provides large Sudoku puzzles that are easy to read. Buy a single copy or subscription to Big Sudoku Puzzle magazine. 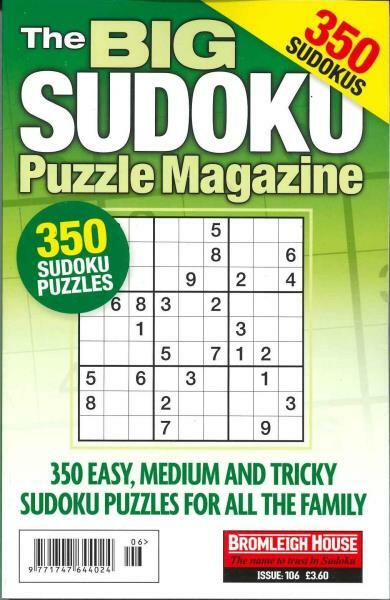 You will find Sudoku puzzles in Big Sudoku Puzzle Magazine that is great for beginners and more advanced solvers. It is thought that Sukoku puzzles are based on mathematical Latin squares which are used in statistical analysis. A Swiss mathematician, Leonard Euler, came up with the idea of putting numbers in a column where a number or symbol could only be used once in each row. The jump to using this philosophy to create puzzles is attributed to Howard Garns, who is credited with developing the Sudoku puzzle as it looks today. Even though Sudokus were developed in America, the name comes from Japan where they were first called Suuji wa dokushin ni kagiru which was eventually changed to Sudoku. The popularity of Sudoku puzzles continuing to grow all across the world. Sudoku puzzles can come in a variety of different styles. There is the mini Sudoku which is usually in a 6X6 grid as opposed to the normal 9X9 grid and the only numbers used are 1 to 6. Another variant is a cross sum Sudoku which combines Sudoku with Kakuro. In a cross sums Sudoku the clues are provided as cross sums. There are also Killer Sudokus which also utilize Kakuro with traditional Sudoku puzzles. Alphabetical Sudoku puzzles are another style sometimes called Wordoku puzzles.